In gram panchayats which are not having existin gram panchayat office any available govt building like school community hall etc will be identified and new Gram Panchayat shal be established in it. All record of Gram Panchayat shall be kept in Gram Panhcayat's office in the custody of Panchayat secretary. All assets and liabilities including staff shal be distributed in proportion to the population among the residuary and newly formed Gram Panchayats. 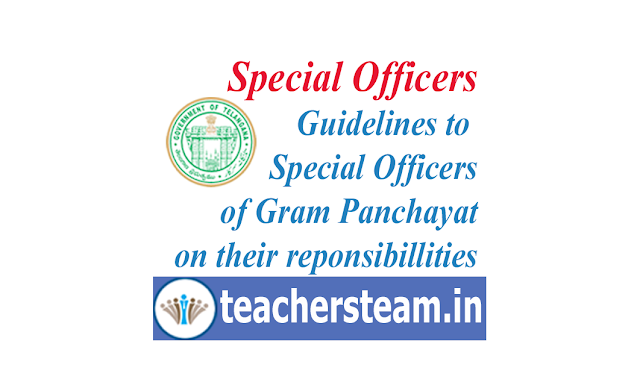 Panchayat secretary of new Gram Panchayat shall prepare demand register and revision register for new Gram panchayat. In new Gram Panchayat , following shall be displayed. a) mandatory board, b)Citizen charter, c) Borad showing the geographical details of new GP. Special officer shall conduct the gram sabha in every two months as stipulated in the TS PR Act, 2018. Special officers shall monitor from time to time whether in the gram panchaya the stagnated water is ballout and the gram panchayat staff is spraying of oil bars in stagnated water to control larvae growth and jungle clearance. Special officers shall supervise and inspect the sanitation conditions in the gram panchayat. Special Officers should take special interest in installation of 3rd wire and LET lights in gram panchayat. special officers shall identify a nursery for gram panchayat, He shoud ensure that water facility and soil condition, minimum protection is available to the site. Special officer should be partiicpating in plantation program 2018 and complete the target given to their village.